You will need: Paper, pencil, scissors, paper clips, water, candle. 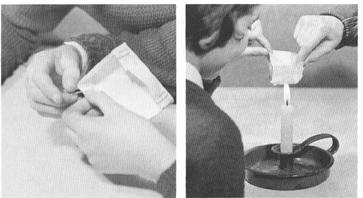 SCIENCE EXPERIMENTS & AMUSEMENTS FOR CHILDREN BY CHARLES VIVIAN. Simple Technical Steped Practical Projects for school and college students. You will need: Paper, pencil, scissors, paper clips, water, candle. As we know, some materials are good conductors and others are poor conductors of heat. Most of our cooking utensils are made of metals because they are such good conductors and therefore cook our food and heat our water in the minimum of time and with as little expenditure of heat as possible. What happens when we use material that is a bad conductor of heat for our saucepan? We will use ordinary drawing paper, and see what happens. Fig. 1 gives the full-size outline for a simply made paper saucepan. Trace this outline and transfer it to your drawing paper. Cut around the outline and fold along the dotted lines, as shown. Use paper dips to secure the four corners of the saucepan. Half nil the saucepan with water and make quite sure that you have a water-tight little container. Light a candle and carefully hold the paper saucepan over the flame. Be careful not to burn yourself. It is best to have a friend hold one side of the little paper container. You will be surprised to find that although you hold the saucepan in the flame for a minute or two, the paper will not catch on fire. When you finally remove the saucepan the water it contains will be quite warm, but apart from a circle of soot on the underside of the container the paper will probably be unharmed. The reason for this is that the water inside the container is a remarkably good conductor of heat, while the paper is a bad conductor. As a result, the water carried the heat away from the underside of the paper so quickly that it had no time to scorch or burn the paper.